The FPU1600 series has been discontinued. Please see the FPU420 as a possible alternative or contact our Flow Engineering department. FPU1600 Series metering pumps are ideal for OEM applications. The basic design makes these pumps not only economical but virtually maintenance free. Standard units have a durable, efficient pumphead assembly, a compact housing, and a fixed feed rate with a variety of RPMs from which to choose. 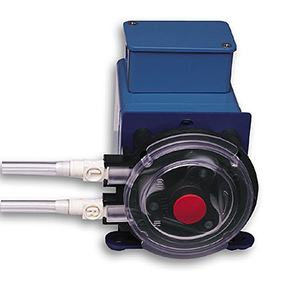 FPU1600 pumps are available with a cycle control percentage timer. Each pump comes with an accessory kit package that includes a foot valve with ceramic weight, threadless injector fitting, two spare tubes, 3 m (10') of vinyl tubing, and a flow indicator (except on ¼" tubing units). 참고: * Minimum flowrates are 10% of maximum. All pumps supplied with Tygon tubing except the FPU1601-N, FPU1602-N, FPU1603-N, FPU1604-N which have Norprene tubing. For 230 V/60 Hz voltage, add suffix "-230V60" to model number; add $12 to price. For 220 V/50 Hz voltage, add suffix "-220V50" to model number; add $12 to price. For 24 V/60 Hz voltage, add suffix "-24V60" to model number; add $20 to price. For timer option, add suffix, "-T" to model number; add $130 to price.